In 1971, famed Minnesota paddler and canoe racer Gene Jensen noticed that by bending a canoe paddle at the neck, where the shaft meets the blade, a paddler could move a hull faster than with an equivalent straight-shaft paddle. Jensen noted that paddlers using straight shafts, “had to dig these enormous holes, and their paddles would really cavitate. They didn’t seem to go as fast as they should.” The rest, as they say, is history. You can scarcely go to a downriver or flatwater race and not see carbon fiber bent shaft paddles everywhere. And because of their efficiency they’ve become rightfully popular with recreational paddlers as well. So naturally, I had to ask “Why?” Why is it that bent shaft paddles are more efficient at moving a hull? Is there an optimum bend angle, and if so, what does it mean for it to be “optimal”? To answer these questions I used a simplified physics model of how a paddle generates force to quantify “efficiency” and “optimal.” Fortunately, I also stumbled upon a nice article by Nicholas Caplan which provided valuable biomechanical data that I used as input to the model. It turns out that you maximize peak padding force and impulse (the time integral of force) if the blade is perpendicular to the water at the instant that the relative velocity between the paddle and the hull is maximum. And using Caplan’s data, based on this preliminary analysis, the optimum bend angle is 12 degrees. Subject to a few caveats. So now that you know the bottom line feel free to move on, go train, etc. Or if you’re curious like me about the why, read on. where d/dt denotes the time rate of change of the hull’s velocity vhull, P represents the propulsive force exerted via the paddle, and D is the drag force acting on the hull in opposition to the propulsive force. The right-hand side of the equation is the net force on the hull. All quantities in this equation except the mass are functions of time. We’ve discussed the contributors to the drag force D in “Part 3: The Rough Stuff.” Ultimately the components of drag – friction, form, and wave – are properties of Nature and the hull design. What we’re left to consider is how to maximize the propulsive force P to create the greatest hull speed. where (“rho”) is the density of water, A is the area of the blade, and vpaddle is the velocity of the paddle blade’s center in an inertial reference frame (e.g., relative to the Earth). The matter of reference frame is important since it is the relative velocity that contributes to the propulsive force. The hull could be moving swiftly downstream, and the paddle along with it (for instance, if you are not paddling); in that case you’re exerting no propulsive force but are just along for the ride, yet the velocity of the paddle by itself could be large. The term CD is the drag coefficient, which is a dimensionless quantity that characterizes the blade’s resistance to motion through water. It is a property of the blade design, and in the equation above is distinct from the blade area A. It is also a function of the shaft angle, defined in Figure 1 below. where (“theta”) is defined as the shaft angle shown in Figure 1, CD0 is the drag coefficient when the blade is perpendicular to the water’s surface (which we’ll call the “baseline drag coefficient”), and cos() is the cosine function. The cosine function is used to ensure that we only consider paddle force along the direction of travel at any instant/angle, rather than force perpendicular to the blade’s power face; to reinforce that we’ll hereafter call it a “direction cosine.” So if we know the shaft angle over time, and the relative velocity over time as well, we can compute the propulsive force over time for a given paddle with area A and baseline drag coefficient CD0. Nicholas Caplan employed high speed video cameras to measure the shaft angle over time, and the relative hull/paddle velocity, of an elite outrigger paddler using a straight shaft paddle. Data! Now it would be natural to just dive in and use his data without thinking about it. But where’s the fun in that? Plus this provides us with an object lesson in interpreting the results derived below, or more broadly, in reading any reporting on science or engineering: read the results in light of the underlying assumptions. By using Caplan’s data we are assuming that the stroke mechanics employed by one outrigger paddler will be the same for all of the rest of us, using either straight shaft or bent shaft paddles. That’s a big assumption, so please keep it in mind. But it gives us a place to start. This approximation is valid from the time of the stroke’s catch at t = 0 seconds until the exit at t = 0.4 seconds, and is plotted in Figure 2 below. The relative velocity is negative because the magnitude of the paddle velocity is greater than the magnitude of the hull velocity during the power phase, as we discussed in “Part 5: What Moves You.” It also means that the paddle velocity is directed toward the stern. (Remember our friend momentum?) The relative velocity clearly varies over time, and its magnitude achieves its maximum value just a bit after mid-stroke (as defined by the time interval between the catch and exit). Hmm… That’s very interesting. Might be worth keeping that fact in our back pocket. Figure 2: Relative velocity from catch to exit (after Caplan). This angular dependence is plotted in Figure 3 below. Since it is linear, the shaft angle doesn’t show any inflection point with maximum magnitude, just minimum and maximum angles at the catch and exit. Figure 3: Shaft angle from catch to exit (after Caplan). Given all that, it’s time to compute some paddle forces! 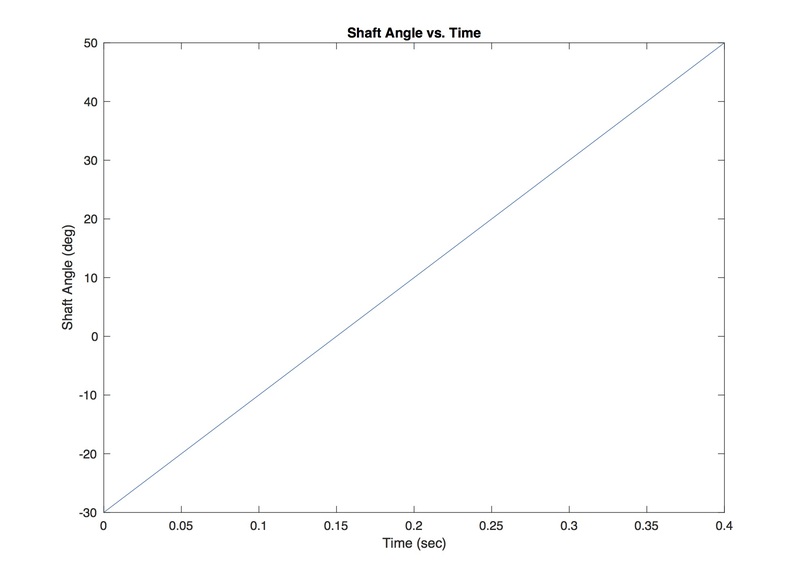 In this equation we’ve introduced an additional parameter (“phi”) which represents an offset to the shaft angle. In other words, phi represents the bend angle for a bent shaft paddle. Now the density of water, blade area, and baseline drag coefficients are all constants. So what do you do to maximize the peak paddle force? You look for variable terms in the equation, then determine how (or when) to maximize their product. We know that the direction cosine and the relative velocity change over time, so it’s reasonable to conclude that we want them to reach their maximum magnitudes at the same time. Engineers call this “in phase.” You will recall from high school trigonometry that the cosine function varies in magnitude from 0 to 1. The cosine reaches its maximum when its argument is either zero or 180 degrees. Here, the zero degrees corresponds to “downward vertical,” and the 180 degrees corresponds to “upward vertical,” e.g. when doing a paddle salute. 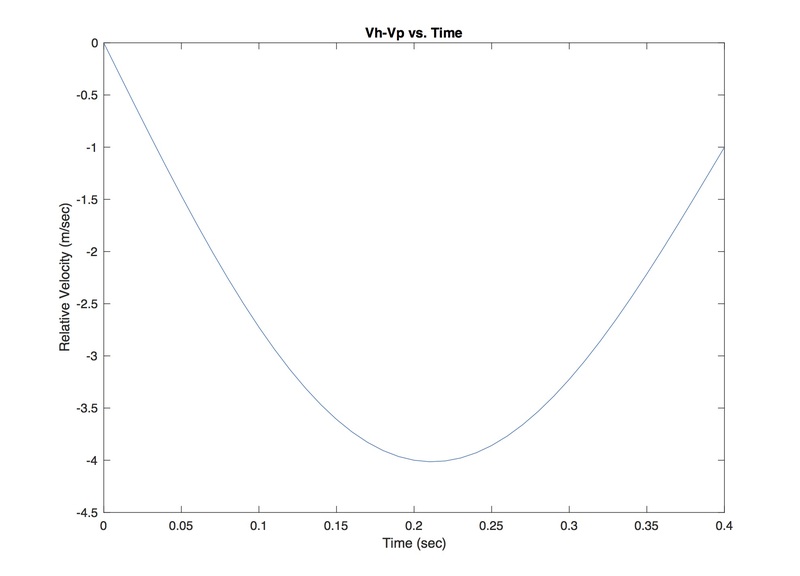 In Figure 4 you’ll find a plot of the relative velocity’s magnitude vs time, as well as the direction cosine in the equation above based on Caplan’s data. In order to fit things nicely on the same plot, and for clarity of exposition, the direction cosines have been multiplied by 4 in this figure. The direction cosine is plotted for two values of the bend angle : 0 degrees (no bend), and 12 degrees. Since from Caplan we know that the shaft angle varies linearly over time, the figure shows that the straight shaft paddle reaches its maximum direction cosine value when the shaft (and hence the blade) are perpendicular to the water. Unfortunately, this occurs before the relative velocity reaches its maximum value; engineers would conclude that the direction cosine “leads” the relative velocity for this paddle. By contrast, the paddle with a 12-degree bend maximizes its direction cosine at the moment that the relative velocity hits its maximum. 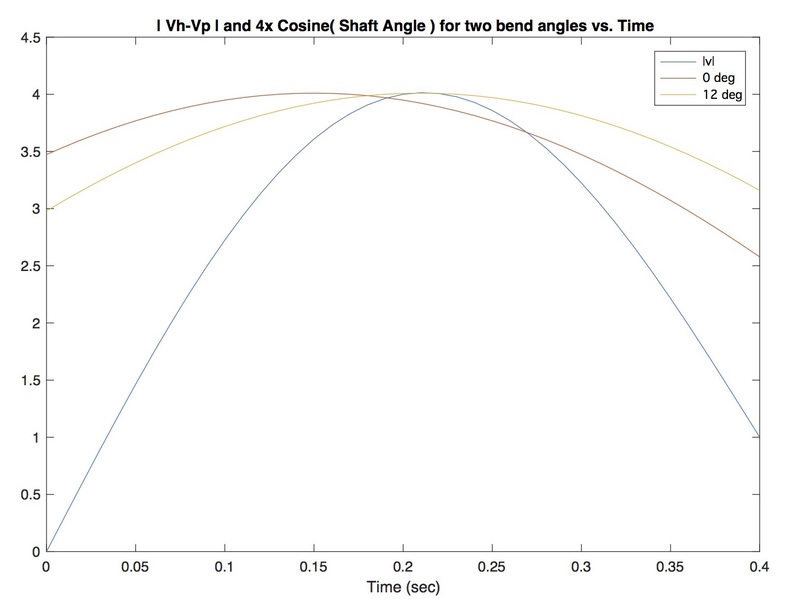 The bent shaft’s blade angle is in phase with the relative velocity. The blade is perpendicular to the water’s surface when the relative velocity is maximum. This is a good thing. Figure 4: Relative velocity magnitude and direction cosine from catch to exit. In Figure 5 you’ll find a plot of the resultant propulsive forces for the straight shaft and bent shaft paddles, computed using the equation above. Since we’re interested in comparing data, and not in the force’s absolute magnitude, for simplicity I set the values of the water density, blade area, and nominal drag coefficient to one. The paddle force for both cases starts at zero since at the catch you haven’t started to pull. The bent shaft’s force profile – the variation in force over time – lags the straight paddle; the bend introduces a phase lag in the force. As you can see from the plot the bent shaft paddle hits a higher peak force than the straight shaft paddle, again due to this “phase alignment.” Further, it hits this peak a bit later than for the straight shaft case. This is because the relative velocity had maximum magnitude a bit later than the power phase’s midpoint, and the bent shaft’s blade is perpendicular to the water at that moment. I had expected the peak force for the bent shaft paddle to be a bit higher in comparison to the straight. But again, we’re taking data from an outrigger paddler using a straight shaft, and extending it using mathematics to the bent shaft case, assuming all along that the mechanics are the same. Still, even in light of those assumptions, the underlying physics is true. Phase alignment is good. 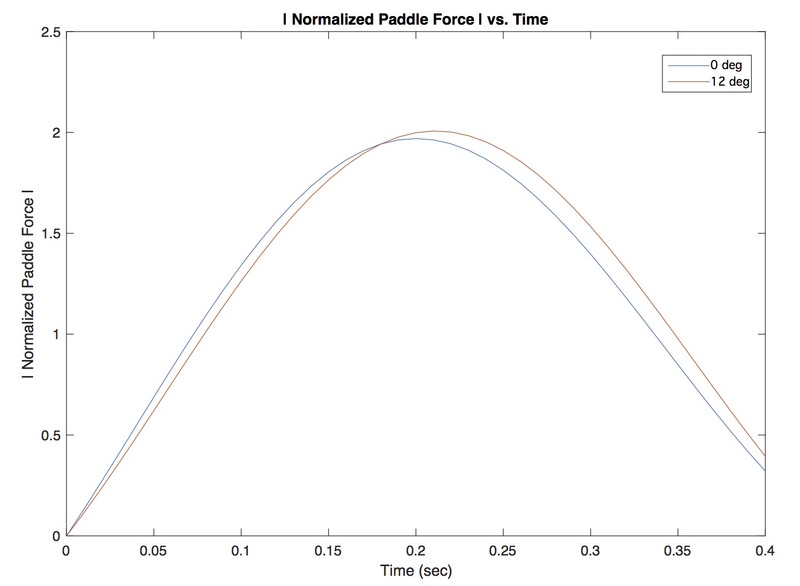 Figure 5: Normalized paddle force vs. Time. So your paddle blade should be perpendicular to the water at the same time that the relative velocity between the blade and the hull is greatest. Great. Why not just cut off the stroke at that point? Wouldn’t that make the hull move fastest? Short answer: No. But great question! In order to arrive at this conclusion I took the time integral of these normalized paddling forces in order to compute what physicists and engineers call impulse. An integral is merely the area under the force curve, here from catch to exit. It captures the entirety of the power phase’s propulsive contribution, not just the peak force. Impulse produces a change in linear momentum, which as we learned in Part 5 determines cruising speed. Using Caplan’s data the bent shaft produced 2.4% more impulse than the straight shaft; in other words, you’ll go faster with the bent shaft. A bit less than I would expect, likely due to our underlying assumptions, but an increase nonetheless. All of the above computations were done in MATLAB. I studied other bend angles than 0 and 12 degrees. But the optimum bend angle for the given relative velocity vs. time, and shaft angle vs. time, was 12 degrees. More fundamentally one would need to measure these quantities for each paddler, and then investigate how to optimize bend angle for them individually. But for a given paddle it is best if the blade is perpendicular to the water when the relative velocity is maximized. Phase alignment is good. And for this first pass, we’ve seen that Gene Jensen was right. Bent shaft paddles are more efficient at generating greater propulsive force. Copyright (c) 2018, Shawn Burke. All rights reserved.